Greedy Mike is all about the long green. 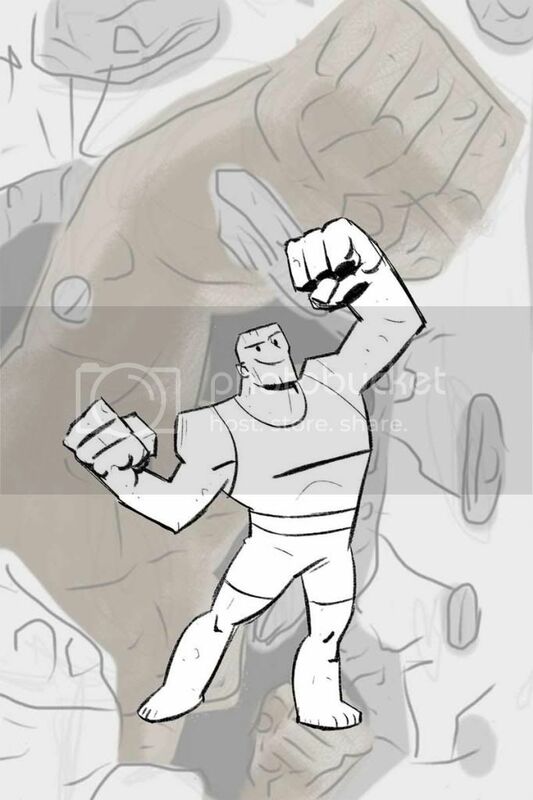 Secret Lash's true identity as Mike Braddock is kept hidden. Skirtchaser Lash seemingly cannot stop himself from hitting on nearly every woman he meets. Enemy Phantom frequently foils Lash's crimes-usually while he's hitting on her. •Mike Braddock has been a criminal since he was a teenager, starting out with petty theft and shoplifting. That soon turned into robbery and burglary, but Mike wanted something more, to make his jobs easier and bigger. He watched a liontamer once and was impressed by the whip, but also by the charm the man used with it-it was flashy and unusual. 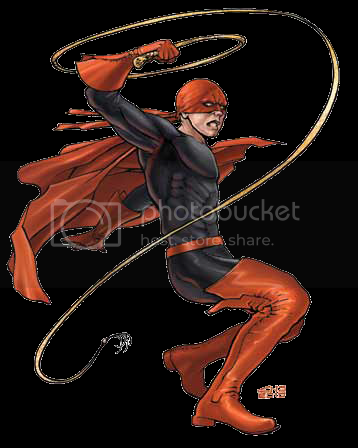 So Braddock reached out to the Foundry, who designed a custom steel whip for him, and Braddock practiced for weeks, designing a costume to become Lash, the daring thief. Since then, he's always pulled jobs for money, avoiding any real violence-except for when Phantom is taking him down. •Lash is a thief, greedy and a helpless womanizer. Aside from that, he's really not a bad guy, and is perfect as a villain for light-hearted campaigns, and as the easily beaten, jokey member of a hero's rogue's gallery. Lash is still competent enough though, and can give weaker PCs and teen hero types a little trouble-before they take his whip and he decides to run rather than fight. Can't Shut Up Zig Zag loves to taunt other people-even those much more powerful than him. Motivation : Greed Harvey is a lazy guy, and using his powers to steal is just about all the work he has in him. Secret His identity as Harvey Pepper. Weakness Harvey takes 50% more damage from cold attacks, and his body is also more susceptible to poisons. •Harvey Pepper was an ordinary guy, a little lazy, a little too flirty at the workplace, but otherwise just a chemical engineer of no real importance. Until an accident involving two unstable compounds and a semi-liquid plastic substance altered his body, turning him into a malleable, rubber man. Harvey quickly turned to a life of crime, and operates in Freedom City, frequently coming into conflict with Johny Rocket. He's also a member of the extended Crime Union, and has on occasion worked with the Crime League. •Zig Zag isn't supposed to be much of a threat, he's supposed to be annoying criminal taunting the PCs with crude jokes and lame come-ons to women. To that point, he's undercapped offensively but fairly hard to hurt with normal attacks. Still, his exotic saves are low, and he has two weaknesses heroes can exploit to bring him down quickly. He makes a good candidate to work with other mercenary criminals, since he's not much for violence and is best used as a distraction for a larger plot. Yeah, one of my favorite things in comics are the villain bars where the blue collar crook* super villains just bro out inbetween crimes. Conquerors: The Big guys, guys out to conquer the world: The Doctor Dooms, the Magneto's, the Lex Luthors, guys who want it all and want it now. Killers: The insane murderers, guys who want to watch the world burn: The Jokers, the Carnages, the Typhoid Mary's. Crooks: The guys in silly costumes who just want to make money. Guys like the Flash Rogues, most of Spidey's foes, and so forth. Zig Zag falls into the latter category. Yeah, I really like how the Champions books point out relationships to other characters for their villains. So Zig-Zag has worked with the Ultimates, hit on Black Diamond, that sort of thing. I especially like the friendship of Double Dealer and Lazer, they're alike (ex soldiers turned mercenary) but also kind of an odd couple-one's white, one's black, one's very professional with hi-tech weapons and armor, the other is more casual and uses samurai swords. And there are plenty of blue-collar get rich quick crooks in there. Along with beautiful women who are usually Crooks as opposed to the other two types. Relationship Leviathan is friends with the supervillain Riptide. Responsibility Though not much of a patriot, Leviathan does have certain duties to the Lemurian people. Weakness Leviathan faces 50% greater DCs against fire/heat attacks. •Leviathan is a High Lemurian, and a genetic "throwback" to the race's earlier days. As a result, he's bigger, more beastial, and much stronger than the average of his race. He's also not nearly as imperious or full of himself-he's a loudmouth, overconfident to be sure, but other than that, he's a normal blue collar guy. He likes to watch sports (and hates Tidus for frequently costing him money betting on blitzball), drinking, loud music and getting into fights. If the people he liked to hang out with weren't usually criminals and supervillains, he'd probably have a much better reputation. 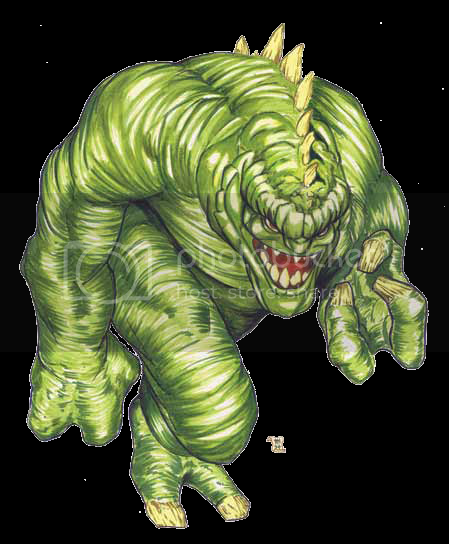 •Leviathan is a basic brick, a little stronger than the average with the added flourishes of being aquatic and having one costly summon effect that is really more for flavor than anything else. In the Crinoverse one of his children, Rothaga attends Avengers Academy and is in a relationship with the hero Foxfire, so between that, his somewhat mercenary ways, and the fact that he's a Lemurian, he's full of potential plot hooks. Lost Without direction from its creator or some other source, Blockbuster is essentially mindless, rampaging without aim. Weakness Due to its alchemical construction, certain magics can be used to bind and control Blockbuster. •A quick 365 Supers build, Blockbuster is a creation of Dr. Azoth, the immortal alchemist. During the Second Silver Storm, Blockbuster was released, and escaped capture when Azoth was defeated. He's been roaming Emerald City since then, frequently getting into fights with Rocky Jones. A simple but powerful build, Blockbuster can be used as a tragic figure, and be mind-controlled by a mystic master villain to give him some extra muscle against the PCs. Enemy Bill Foster is Alchemica's most personal foe. 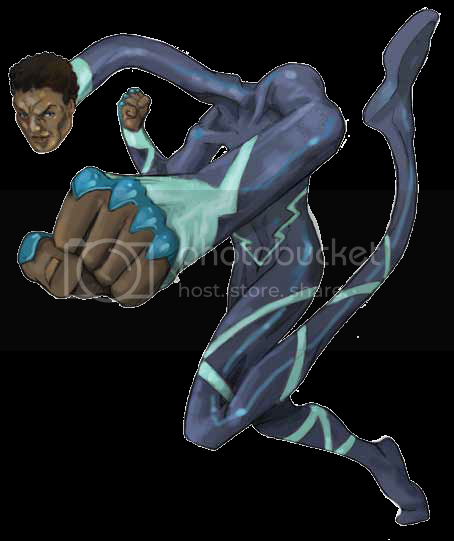 She has also frequently fought the Avenger, Elasto. Honor Alchemica has a code against killing. Ego Alchemica wants it all-money, power, and respect. To that, she often goes the extra mile to "prove herself." Identity Alchemica's true identity as Nikki Wilcox is public record. 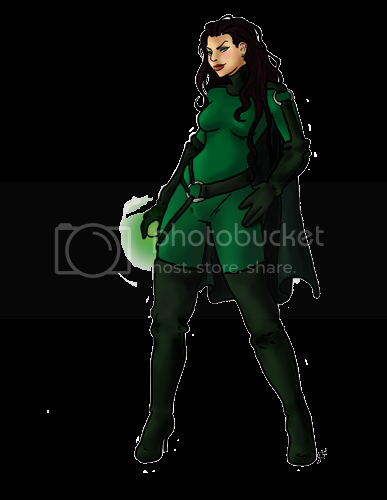 •Alchemica is Nikki Wilcox, a girl from Emerald City who gained her powers in the first Silver Storm. However, her powers of transmutation were very weak, and lay dormant until one day, while EC University, she came into contact with the Philosopher's Stone that had once powered the homonculi, Envy. It had been brought in by Bill Foster, teacher and superhero, to study. Her powers grew, and she decided to take what she want and hurt those who she didn't like. She started at the college campus, terrorizing a few professors, until Foster and Elasto (who was also a student at ECU at the time) stopped her. She was eventually freed from Super Alcatraz during a breakout, recovered her Philospher's Stone, and has recently joined the Crime League, with the sorcerer Medea bonding the stone to her body, enhancing her powers and ensuring she can not be easily stripped of them. •Alchemica has a variety of effects built around transforming things, and could powerstunt any more, as needed. Her power is very versatile, and rather effective, but she's not quite the top-tier villain she wants to be. To become so, she might seek out any potential source of power-magic, super science, whatever. Her Philosopher's Stone ties her to certain alchemic figures, like Zorran the Artificer and his Lemurian overlord, who might seek to capture her for study, or simply dissect her and take the stone. Other than that, her new position in the Crime League has gone to her head, and she'll often commit bombastic crimes just for the thrill of it, forcing heroes to come to the rescue when she's transformed City Hall into a giant diamond for her to admire. Last edited by Arthur Eld; 05-17-2018 at 05:21 PM. Power Loss Arrowhead's great aim and skill come from his mutant nature. 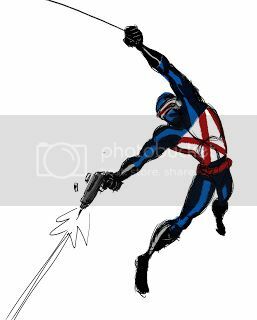 If his powers were nullified, he would lose his Powers and his Dexterity and Agility would drop to 4 each. Identity Jared Williams is a known and wanted mutant criminal as Arrowhead. Showoff Jared cannot resist a challenge, and loves showing off his athletic skills. •Jared Williams had a lot going for him-brains, decent looks, a happy family life, and tons of athletic ability. He got into college on a full scholarship for tennis and track, but a jealous teammate accused him of using steroids. During testing, it was found Jared wasn't on steroids, but he was a mutant-which even he didn't know. The school assumed he'd been hiding it deliberately and took away his scholarship. At first, Jared saw the revelation that his skills came in part from superhuman hand-eye coordination and heightened agility as a curse, but then he realized since everybody already thought he was a liar and a crook, he might as well become one. He became the supervillain Arrowhead, and, aside from a brief stint in prison (during which he was moved from regular prison to Blackstone following two near escape attempts), he's been fairly successful. •Arrowhead is that villain who has the blowhard attitude of a D-list wannabe, but actually manages to be a credible threat. Against someone like Bowman or Green Arrow, he'd put up a good fight with a fair chance of winning. His showboaty attitude just makes him all the more irritating. 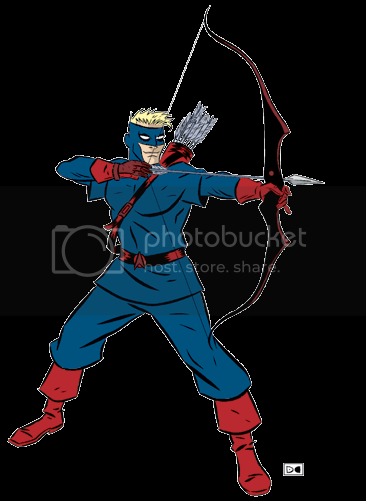 Aside form his bow and trick arrows, he has Bullseye-esque throwing abilities, owing to his superhuman powers. They're not much, but combined with his training, make him deadly with anything from his bare hands to a bow to a thrown fork. I like his costume too, simple but it stands out, and you just know he can use that belt buckle as an impromptu throwing star when he has to. Last edited by Arthur Eld; 05-17-2018 at 05:24 PM. D.I.D. From time to time, the personalities of the archetypes Tony calls upon can influence his mind, causing him to act in an uncharacteristic fashion. No instruction manual Certain manifestations of Tony's powers are difficult to control, especially when he calls upon someone's powers for the first time. This can range from shorting out nearby electrical devices when he channeled Static's powers, or the massive headaches that using psionic powers tends to bring out in him. •A PBP character of mine, Avatar here is Tony MacKenzie, a Freedom city chemist who unlocked a formula that reacted with his natural psionic ability and put him in tune with the collective unconsciousness. Through it, he is able to channel the power of a number of heroes, villains, and other figures of importance, real or fictional. Now he serves as one of the newest members of the Freedom League. Disavowed Fed-X has no true identity, as far as the law is concerned. Responsibility To defend the United States and support its interests. Wanted The agent known as Fed-X is wanted for espionage in a number of countries, including Thule, Ruritania, and others. •Back to 365 Supers, Fed-X is a dynasty in the US government, a series of agents chosen to carry out top-secret missions of the utmost secrecy. Each Fed-X agent has his civilian identity arrested and convicted of treason, believed to be dead by most of the world, so they can give themselves over totally to their work. The current Fed-X has worked with AEGIS, the CIA, and other government agencies, but in truth answers only to the President and a select few other highly ranked defense officials. He is exceedingly efficient at his job, but makes it a point to never be unnecessarily lethal. •Fed-X is useful as a shadowy support character to the PCs when they're doing something espionage-y or that otherwise involves overseas travel. He can be their Mr. X, their Grey Fox, what have you, providing last-minute saves and important information so the heroes can save the day. He's a typical agent character, skilled, good in a fight and with his head, but not really great in pitched superhuman combat. Last edited by Arthur Eld; 04-10-2015 at 01:08 PM.